From Lantzville to Labieux Rd (Diver Lake area), there are 10 manufactured home parks where you can own a home on a pad rental. The ten parks are discussed below, then there is a list of all active listings. Crest 1 (1 small dog or 1 indoor cat) (55+) - 6245 Metral Drive, near Superstore and Home Depot. Crest 2 (55+) - Just south of Crest 1; has an RV storage compound. Streets are Denver, Dunbar, Farber, Nabor, and Rich. 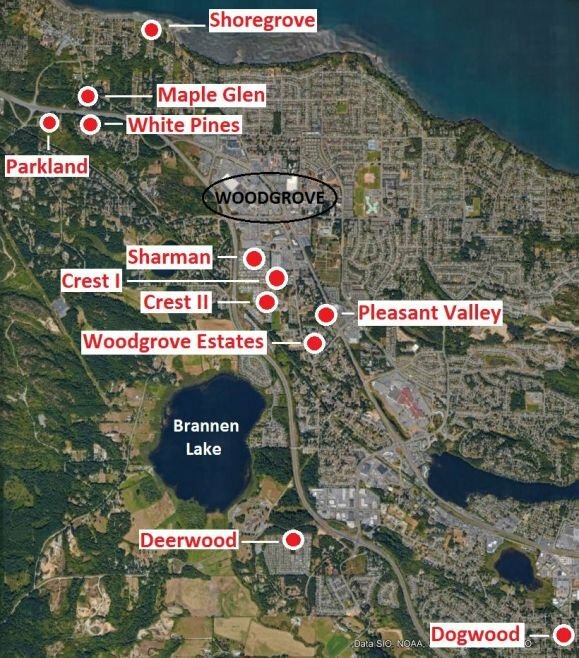 Deerwood (55+) - Highest-end MHP in Nanaimo. Addresses are on these Drives: Deerwood, Excalibur, Honey Locust, King Arthur, Magnolia, Maplewood, Merlin, Mimosa, Valewood. Dogwood (55+) - 2501 Labieux Road (Brian's Way) - Walking distance to Country Club Mall and Diver Lake, Beban Park. Sharman Park (no pets) (55+) - 6325 Metral Drive - Behind Superstore and Home Depot. Shoregrove (55+) - 6990 Dickinson Rd - Lantzville beach direct access. White Pines - 7134 Blackjack Dr - Small park in the forest close to the highway. Listed for sale in 2019. Active listings are below. If you want to be notified when new listings become available, contact me.